Finally, I’m at NYC, after soooooo many years! I was still a kid then when I last went here. Oh how it has changed! We had quite a lot on our agenda this day–a lot of shopping that is. It was fun navigating through the streets and subway system of New York City. How New Yorkers do all these in heels, I will probably never comprehend. Since I lack the ability to run down the streets like how Carrie did, I think I’ll stick to my favorite summer sandals for now. As you can see, if it weren’t for my flats, my outfit was a little bit dressy for a casual day of shopping. 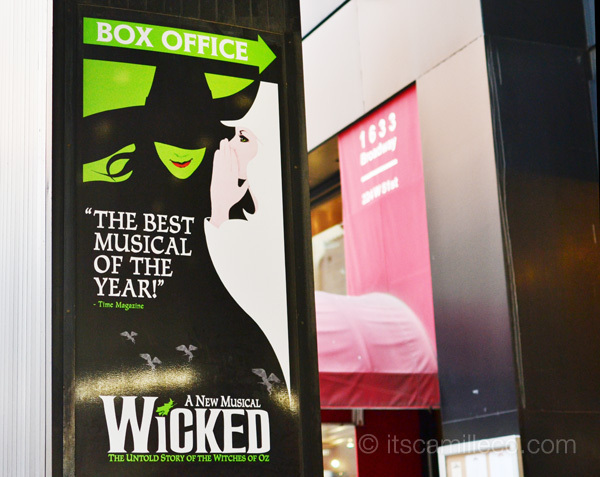 This is because we were watching the Broadway musical hit, Wicked, later that night. I just changed my shoes and I was good to go! Can I just say, WICKED WAS AWESOME!!! I enjoyed the show thoroughly. Glinda the Good Witch was such a delight to watch! Here’s a little snapshot I took of the center stage before the play started. 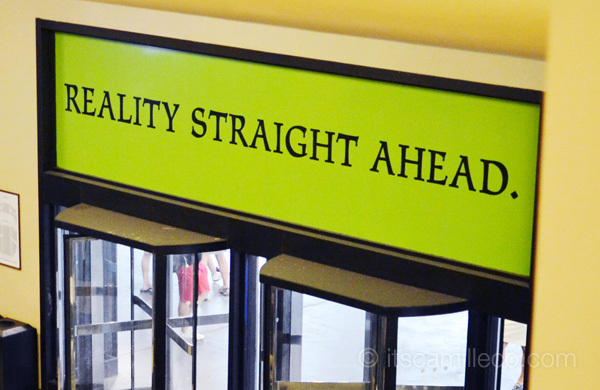 After the show, this is the sign that greets you on your way out. I found it really cute! I wish I was able to watch more shows during our stay in NYC. I wanted to watch the Book of Mormons the most but scoring good tickets were so hard! 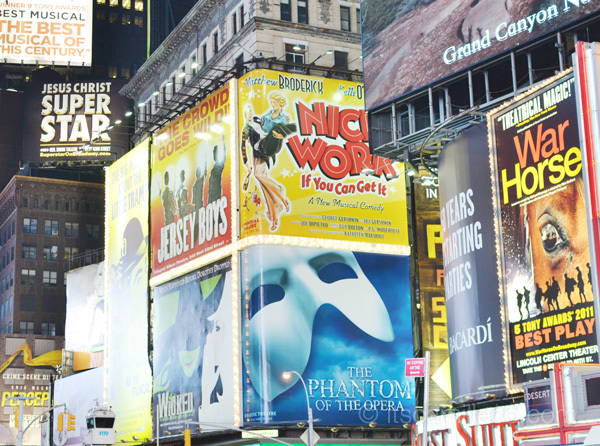 Guess where this collection of Broadway show billboards are situated? Yup, you guessed it! 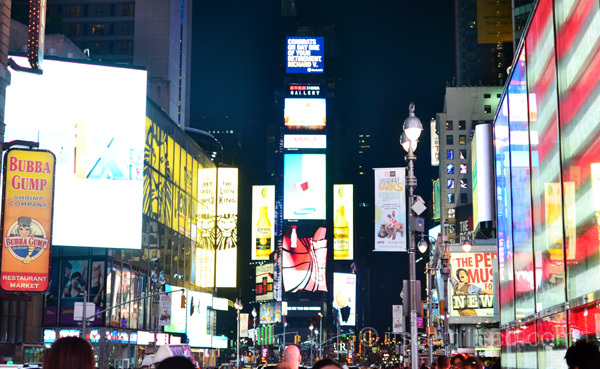 No other place but Times Square! It’s one of the few places I remember seeing when I went here as a kid. Don’t you just love those lights? There’s actually a set of stairs on the bottom of the LCD screens located at the center where people can just sit down and take the view in. Then to your right, there’s a HUGE LCD screen where you’ll get the chance to see yourself for a few minutes. Try to spot me! My friend and I had such a hard time looking for ourselves. Clue: I’m wearing a blue buttondown. 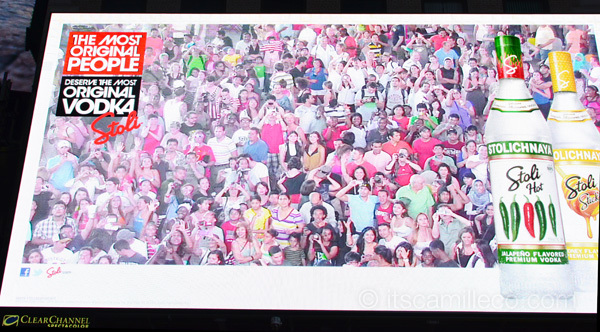 Look at how much people are there! It was already past midnight, mind you! Sure! :) Thank you Yvonne! You are so beautiful girl. I like your blog – if you like check mine and we can follow each other – what do you think? Thanks Alonica! You’ll love NY! It’s just amazing how you make everything look elegant. P.S. Still searching for that dress on Multiply. Hahahaha. Hoping tomorrow will be better! I want to visit NYC too. But because I love Gossip Girl and Serena and Blair made NYC more fascinating to see. Haha! Thank you Elika! You found me! Congratulations haha! Aray.. naduling yata ako kakahanap dun sa last pic. You were either of the 2 on the lower portion of the screen by my guess. Shame you didn’t get to catch the Book of Mormons. Maybe you can score seats to Potted Potter here? And that is on Fancy McDo! As for your dress; It’s rather, uh, flouncy. Haha I make a better where’s Waldo! 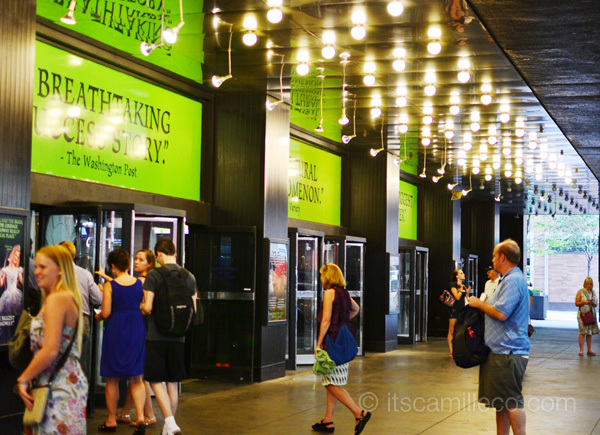 If I go to NY again, I’ll make sure to catch Book of Mormons! Thanks kat! I really want to go to Korea! I just love how your tweed jacket makes you look like aristocratic! :D love it! Thank you Daniela! :) Tweed is so sophisticated! Yes! You’re right1 That’s me! Sharp eyes you have there! :) Thanks Elaine! The hot summer weather in NYC called for sandals like these! New York is just wonderful. <3 The last photo is like "Where's Waldo?" but a Camille Co version. :)) I just can't find you yet! Haha! Squint really hard haha! I was in New York last week!! I still miss it so much now! I really wish i got the chance to see the Broadway show too!! ahhhhh!! NYC is just a dream! i want to go there too!! I absolutely love your style and reading your blog ! Such great inspiration ! I am a new blogger and would love for you to check out my blog and follow back if you like it ! Thanks Camille! Please continue to be the Top fashion inspiration here and all over the world! Thank you Chai! DOn’t give up, I’m somewhere there! Haha! Cosplay is serious stuff! Congrats on the awards! I wasn’t born naman with a silver spoon and I can’t do and get everything and anything that I want. But that’s a great attitude, we should appreciate what we have :) Thanks Desiree! Wow. It’s soooo nice. I’ve never been, but I will one day =)) I really love the dress. I don’t think the sandals you’re wearing will fit me nicely though. Stay safe!!! Hi Camille! As always, you look gorgeous! Love your shots. What cam are you using? Your night shots are great! 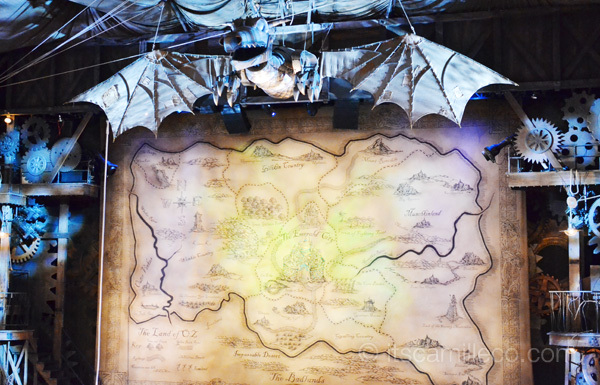 Wicked is so good! You should watch1 :) Thanks Vanessa! it’s better to wear flats than heels pagna-mamasyal lalo na pag talagang malayo or whole day kang mag gagala. hehehe of course kailangan super cute outfit na pang-parnter sa ating mga flats. hehehe. I can’t seem to be able to find you on that screen! Care to give me a clue as to where you are? i sat on the checkered couch and dreamed of a galaxy filled with gumdrops. im inlove with your dress. pero nung ki-nlick ko pa yung link ng Stylista, not found po. i was hoping i can get the same dress. it’s adorable !! Gorgeous! 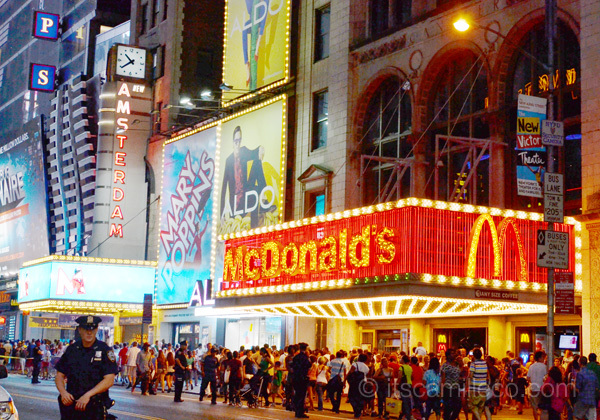 i love NYC, makes me wanna be there so badly! Saw your looks on lookbook.nu and had to check out your blog! So glad I did, just as beautiful as your style! Keep inspiring others through your blogs! Godbless! such a super fun trip! Thank you Isa! It is! Good job! I love this belt too! Thanks Nicole! LOVE It! Your pictures got me so excited even more, kumakabog na nga puso ko, haha. Great outfit! 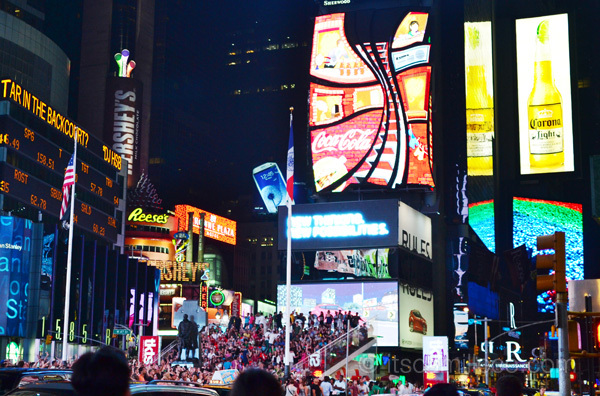 Wish I can go to NY soon! What’s your lip colour here? So pretty! Hahaha you’re so funny Molly! Are prices in vintage stores cheaper or more expensive compared to the brand new ones? I love your sandals! Would you spend hundreds of dollars for a pair of designer flats? Because sometimes I see designer sandals which are way more expensive than their heels. Most of the time naman kasi designer flats don’t have anything special with it (unless it is embellished w/precious stones and whatnot) as in they look almost the same with high street branded ones. I hope you’re enjoying New York!! Thank you Alison! I enjoyed so much! everything is beautiful about this look.. i spend most of time at work so i wish i could wear the same dress in the office.. i may as well check if that can be allowed.. haha! take care, Camz.. enjoy the trip. Love your outfit! Esp. your tweed jacket! I wish we could have gone to Broadway! I wanted to go to the Met too, but we didn’t have enough time. Have you been to the Met, ate Camille? I actually sand your comment haha!